Ramesh is the sole earning member of his family but he had to leave his job and go back to his hometown, Patna. He is among many migrant labourers who have left this satellite town of the Indian capital in the past 15 days due to the verification drive ahead of the Commonwealth Games. The Delhi government took control of the Games Village, including the work related to the maintenance, housekeeping and cleanliness after the Prime Minister's intervention in correcting the Commonwealth Games (CWG) mess. The flooding of Inter-State Bus Terminus has brought a lot of discomfort to large number of people as the services at the capital's busiest bus terminus, biggest in the region, have been hit hard. The water level in the Yamuna began receding in the afternoon after flowing well over 207 metre, but the flood situation in many low-lying areas of the Capital remained grim and people continued to suffer. Flood water entered the houses at Nangla Nagli village. The district administration rescued 300 persons from the village and taken them to safe places. The water entered the village around 1 am. By the time the rescue team came, the majority of villagers had shifted out. More areas of the villages in this district falling along the banks of the Yamuna got inundated as the water level in the river continued to rise. Members of all the 25 families residing in Rajopur Khadar village were shifted to a camp in Mohana village late last evening. The oncology department of Fortis Hospital, Noida, has given a new lease of life to a 20-year-old Iraqi woman through bone marrow transplant. She had been diagnosed with cancer in Iraq and administered chemotherapy there before being brought to Fortis. Reacting strongly to the frequent strikes and dharans being held by the Delhi University Teachers Association, vice-chancellor of the university Deepak Pental has issued a notice to all college principals, stating that any teacher not taking classes due to strikes will not get his/her salary for that day. A 51-yeard-old woman is the oldest mother in the world to have delivered twins through IVF without depending upon a donor, a private IVF centre said today. After having been childless for 23 years, Anita Mathur, 51, is now a happy mother of twin sons, Anuj and Tanuj, and Dr Manika Khanna, consultant gynaecologist and IVF specialist, Gaudium IVF Centre, claimed it was a world record. Dengue continues its march in the national Capital, with as many as 95 more people diagnosed positive with the disease-highest in a day-pushing the cumulative number of confirmed cases to 2,631. With the arrest of one woman, the south district police has solved three cases of shoplifting from different showrooms in Select City Mall, Saket, and also recovered Rs 65,000 and one stolen driving licence from her possession. 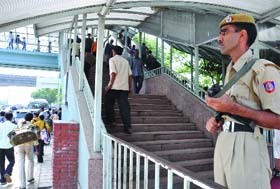 Scores of workers, trade unions, students and civil rights activists held a dharna outside the Commonwealth Games organising committee headquarters in Jantar Mantar against the collapse of a foot overbridge at the Jawaharlal Nehru Stadium on Sep 21, leaving 27 workers injured, five of whom are critical. With the arrest of three members of a gang of carjackers, the south district police has claimed to have recovered the stolen car of west Delhi MP Mahabal Mishra, Ford Endeavour SUV. An ice-cream vendor, who bludgeoned to death a man after a petty argument, was today sentenced to rigorous life imprisonment by a local court despite the judge agreeing to the defence plea that the prosecution had failed to establish the motive behind the murder. With the arrest of two contract killers of a notorious group of criminals-- Bhura gang-- yesterday evening, the south Delhi police claimed to have foiled a plan to murder a south Delhi businessman. An engineer of the electronic appliances company Samsung was today robbed near Sector 37 while he was waiting for his cab. In a complaint, the victim has stated that he was waiting for his office cab near the Sector 37 crossing when three youths on two motor cycles came and showed him a mobile phone. Though the drive is good for the safety of the residents, the labourers allege that the Gurgaon police are harassing them in the name of verification. "I can fill the form and give it back to the police but the officials are threatening us. They talk rudely and say they will arrest me. I am leaving the town and will come back after the Games," 24-year-old Ramesh told IANS before leaving. The massive drive is to get the antecedents of migrants verified. As the workers have started leaving the city, the worst affected are the industries. Almost 50,000 migrant workers have left Gurgaon. "There are almost five lakh migrant workers in Gurgaon and more than 20 per cent have left the city due to the verification process," IMT Industrial Association general secretary Manoj Tyagi said. "Small-scale industries are mainly facing the problems. Some of them are about to shut down due to the shortage of workers. We are not able to match the deadlines for export, and are loosing foreign revenue," he added. The group of 20 small unit owners met Gurgaon police commissioner S.S. Deswal last week, asking him to soften the norms of the verification process. He agreed to accept identity cards as proof which will be provided by the industries or the contractor. "The industries are losing workers, so we have decided to soften the norms of verification and now we are accepting the identity card as verification proof given by the industries," Deswal said. The industrialists are worried they may not meet the deadlines. Gurgaon police even arrested 11 landlords for not having got done the mandatory verification of the antecedents of their tenants. "Not only the industries, the residents of the town are also facing the shortage of workers. I have to wash my car because my servant has also left due to the drive," district public relations and grievances committee president Jagan Nath Mangla said. The migrant workers belong mainly to Bihar, Jharkhand and Madhya Pradesh. Most of them do not have any identity proof such as ration card, driving licence or voter ID. "We came from Bihar to work here. We do not have any identity proof, which is causing problems for us," said Rajeev, an industry worker. "We are afraid because of this drive. Some of my friends have left the city due to lack of any identity proof. But now my employer has given me an identity proof, so now I am feeling relaxed," he added. Chief Minister Sheila Dikshit visited the Games Village this morning to assess the situation after some international teams opting to delay their arrival in Delhi for the Games. She stayed at the village for around three hours and took stock of the maintenance and cleanliness facilities. She directed all those concerned working in the village to finish the cleaning work within next 24 hours. The handing over of the village in East Delhi to the Delhi government came after criticism over the poor maintenance and filthy conditions at the complex. To date, the maintenance of the village was being done by the Delhi Development Authority (DDA) which is under direct control of the Union urban development ministry. required, more officials will be put into service, the official said. Cleanliness and maintenance of the Games Village has come under sharp criticism from foreign participants as well as Commonwealth Games Federation chief executive Mike Hooper who recently described the facility as 'filthy and unimaginable'. Concerned over the unhygienic conditions at the Games Village, Commonwealth Games Federation chief Michael Fennell had shot off a letter to the cabinet secretary asking him to take immediate steps to fix the deficiencies in the residential zone of the village which, he said, has shocked advance parties from New Zealand, Canada, Scotland and Ireland. The level of water remains high and the low-lying bus terminus is almost overflowing with water and many buses are more than half submerged in it. "In the last one month, bus services have been halted for many days. Rains have never hit the traffic as much it has this year," Ashok Kumar, a DTC operator, said. Buses at some routes are plying from the Ring Road but their frequencies have been disrupted. "I commute between Ludhiana and Delhi almost every week due to business reasons. I prefer buses as they are available all the time. I had to wait at the Ring Road yesterday for a long time before I could board a bus," Rohit Sharma said. Many people prefer bus traffic to the train to go to their destinations in states like Punjab, Haryana and Rajasthan as buses are, unlike trains, available all the time. Travelling by buses is also the only feasible option for hundreds of commuters who make last-minute plans, when getting reservation in trains is almost impossible. Officials at the ISBT said they tried to pump out the water but as water surged, it proved a futile exercise. 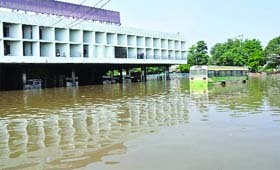 Though some passengers said the ISBT administration should have prepared in a better way, officials said there was little they could do faced with such deluge of water. "We can't be blamed if the ISBT is located at such a low altitude. In the surrounding areas like Monastery, people have been forced to use boats. There is no way anybody could have avoided suspending the bus traffic from the ISBT in these situations," Malkit Singh, an official of Punjab Roadways, said. A 15-year-old girl was killed while her elder sister and mother were injured in the national Capital early today morning when their house collapsed due to incessant rains. The incident was reported from the Vishwas Nagar area of east Delhi. "A 15-year-old girl died in the incident while her 18-year-old sister and 40-year-old mother suffered injuries," a senior police official said. The injured are being treated in a hospital, the official said, adding that the house collapsed due to rains. After yesterday's night-long rain, it was a pleasant cloudy day today in Delhi. The day temperature plummeted five notches below average at 28.7 degree Celsius. The minimum temperature was recorded at 23 degree Celsius, normal for this time of the year. The humidity levels oscillated between 98 per cent and 75 per cent. The weather department has predicted more rains for tomorrow. "Sky will be cloudy with rains or thundershowers at night or early morning tomorrow," said an official of the meteorological department . While the maximum temperature tomorrow is expected to settle around 30 degree Celsius, the minimum is expected to hover around 25 degrees Celsius. An official spokesperson said the water level was at 206.6 metre in the evening and would decrease further. Though over 1.5 lakh cusec water released by Haryana from the Hathnikund barrage is expected to reach Delhi tomorrow, he said the water level should not be reaching 207 metre again. "We expect the water level to be around 205.6 metre tomorrow morning," he said. The danger mark is 204.83 metre. However, the receding Yamuna did not give much solace to the people in Mukherjee Nagar, Indira Nagar, Civil Lines, Rani Bag, Pitampura, Jaitpur, Hakikat Nagar, Batla House and many other localities as life remained miserable for them. Thousands of people in these areas have their ground floors flooded and are living on upper floors. At many places, residents have pitched up tents on their roofs where they have been putting up. Delhi has received 187 per cent more rains in September, but the main harm has been done by the frequent release of water by Haryana from the Hathnikund barrage. Authorities have, however, said things should improve in a couple of days as they believe rains would be subsiding as per the forecast. "Around 300 villagers were evacuated through boats, said district magistrate Deepak Aggarwal. Several NGOs too came forward to help the villagers. They were shifted to community centres and temporary shelters. Many of them moved to the houses of their relatives at other villages. Situation in around two dozen villages in Greater Noida was worse. The water level was just a few centimetres below the village roads. The district administration has already sent the rescue teams there. Earlier, residents of Mahabalipur village and Indra Nagar had been shifted to camps in Khatkal Nangla village and Acheja. Residents of Atawa, Gurwadi, Satwagarhi, Bilochpur, Laharpur, Hassanpur and Sati Ka Nangla residing in the lower reaches were evacuated to higher planes in their villages. ponds were so flooded that they could not be distinguished from normal areas which were inundated. Except Mahabalipur, Indra Nagar and Rajopur Khadar whose residential areas are deluged, other about 32 villages are safe so far. However, the situation is still alarming, according to a senior officer. Dr Rakesh Ojha, head of bone marrow transplant and hematology department, said it was the first case of successful bone marrow transplant in a private hospital in UP. Bone marrow is the sponge tissue that fills bone cavities and is responsible for producing blood elements, white blood cells, red blood cells and platelets. He said, "Maha's bone marrow had residual disease and needed allogeneic bone marrow transplant. For allogeneic SCT, the patient needs an HLA (human leukocyte antigen) of a matched sibling. In this case, Maha's HLA type matched with the HLA of her 12-year-old brother." Dr Ojha said that the latest technology and new approaches have reduced the intensity of bone marrow and stem cells transplants, but the treatment is costly and unaffordable for a majority of poor patients as the incident of cancer shows no signs of diminishing. "Maha was discharged 21 days after the transplant. In the next few weeks, she will acquire the blood group of her brother and her entire blood and immune system will be of her brother's origin. Now the patient will visit us weekly for the next two to three months, after which she can return to Iraq," says Dr Mitu Shrikhande, senior consultant. "In order to protect the interest of the students, the vice chancellor, in exercise of his powers conferred under statue 11-G of the statues of the university, has decided that the teachers who abstain from duty due to strike or demonstration etc should not be paid salary and allowances for the period," read a statement issued by the DU registrar office. In less than a month, nearly 16 days of classes have been affected due to strikes. The reaction from the vice-chancellor comes at a time when even the students are concerned about the lagging syllabus in science subjects with the first semester exam beginning on November 20. Mathur delivered babies in December last year. Addressing a press conference, Khanna said they searched to know if there was any older mother, who has been impregnated with her own eggs, in the world but did not find any. Before her, at a New York IVF centre, a woman had conceived at the age of 48 using her own eggs, she said. Mathur was emotionally shattered when she reached us after going through all the possible treatments, including Ayurvedic and two cycles of In Vitro Fertilisation (IVF), said Khanna. Her case is unique as she though being old conceived through the supportive intervention using her own eggs instead of a donor's, and the treating doctor Manika said, "After hormonal tests, it was learnt that her eggs could be developed as she had not reached menopause. She was given hormonal injections (gonadotropin) for 10 days and after fertilisation, five embryos were implanted. After 15 days, we got to know that she had conceived." With increasing age, fertility also takes a dip and the success rate of IVF is 35-40 per cent for women between 35-40 years of age; for those women falling within 40-45 years, it stands at 25 per cent and after 45 years, the chances of a successful pregnancy through IVF technique plunges to less than five per cent. With the city reporting nearly 70 new dengue cases every day, the cases are expected to breach the record of 2006 when the outbreak had seen 3,336 cases of the disease. 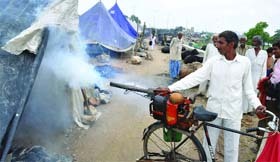 While the authorities have been carrying on intensive exercise of fogging and spraying around the city, especially the areas sorrounding the Games venues, dengue is setting landmarks-the city reported 86 cases yesterday. The authorities refuse to admit that the situation is going out of control. They have no answers other than blaming the incessant rains. The authorities maintain that adequate measures are being taken to contain the rising threat of the vector-borne infection. The figures recorded by the city's private hospitals and laboratories continue to be much higher than the data given by the MCD. Hospitals like Batra, Apollo and Max have been receiving 30-50 suspected patients of the viral disease each day, while 20-30 per cent of those turn out to be positive. Even as most of the private hospital authorities refused to give figures as directed by the civic body, sources from Moolchand said this year, the hospital has treated over 300 patients. But, the official version of the Municipal Corporation of Delhi does not attest to it. According to the police, the accused was caught in the CCTV footage while she was lifting a bag inside a showroom at the mall. Her photographs were then circulated amongst the local residents. She was arrested yesterday when she came to commit another theft at Select City Mall. According to HGS Dhaliwal, DCP (south), the accused has been identified as Sunita Sharma (42), resident of Ansari Road in Darya Ganj. When accosted by the police, she started dropping names of some influential officials to pressurize the investigating officers, but as she was shown her photos in CCTV footage, she broke down and admitted to her involvement in shoplifting cases. The accused has previously been arrested in similar cases from the markets of Karol Bagh, Sarojini Nagar, Central Market, Lajpat Nagar, etc. "She owned a guesthouse "Shivam" in Katra Bariyan, Fatehpuri, but it was closed down for want of customers. Her only son is alcoholic and does not earn anything. Sunita started operating in posh markets. She has since renovated her guesthouse having 25 rooms with a hope to earn lots of money in the forthcoming Commonwealth Games," said Dhaliwal, adding that her husband passed away about 10 years ago. The protesters pointed out towards the fact that workers had been exposed to dangerous working conditions at the CWG sites. They said the games were being used by the builders to make profits. These builders, many of whom acquired tenders surreptitiously, have unhesitatingly exploited workers and built structures of poor quality to save costs. Apart from Mishra's car, two other stolen cars-Santro and Tata Sumo-- have also been recovered. The accused have been identified as Sunil (35), Satya Rao (30) and Jasbir (29). According to a police officer, the three were arrested on Sunday evening from near Vasant Kunj on Mehrauli-Mahipalpur road. They were traveling in a stolen white Santro car. Mishra's car was jacked by one Sunil-Asif gang on the night of August 6. The gang then sold the car to one Satya Rao and Babloo for Rs 2.5 lakh. Rao and Babloo sent the car to Wasim Qureshi of Meerut. Qureshi changed the engine and chassis numbers of the car, prepared its forged papers and returned the car to Rao and Babloo. Rao was supposed to sell the car to one Narender in Jaipur. But before he could do this, Narender was arrested. So Rao requested Sunil to keep the car at a safe place for some more time. The accused then took the vehicle to Industrial Area Phase-III, Bhiwadi, Rajasthan, and parked it in front a factory. The court also slapped a fine of Rs 1,000 on the guilty. District and sessions judge S.P. Garg held Raj Kumar guilty of killing Karan Kumar of Bihar and said his crime was very serious as he killed a young person without any provocation. The judge also took into account the fact that Raj Kumar hit Karan Kumar repeatedly till he was dead. Karan Kumar was beaten to death on the intervening night of March 22 and 23, 2009 at the Rakab Ganj gurdwara near Parliament. However, the judge declined to award death sentence to Raj Kumar, as demanded by the prosecution, saying that it was not a rarest of the rare case, a benchmark the Supreme Court has set for courts to award the capital punishment. The court agreed with the defense contention that the prosecution had failed to prove the motive behind the killing of Karan Kumar, but said that it was not important to the case as it had been proved that Raj Kumar was indeed the murderer. A senior police official, who had arrested Raj Kumar after the murder, was the key witness to the case. 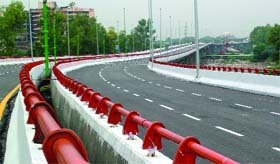 According to the police, the arrest was made at Bishma Pitamah Marg near the Jawaharlal Nehru Stadium flyover around 4 pm. An automatic USA-made .32 mm pistol, seven cartridges, one button-actuated knife and a luxury car have been recovered from their possession. According to H.G.S. Dhaliwal, DCP (South), the accused have been identified as Arving Bhati (28) and Dharmender Bhati (32), both residents of Chiti village in Gautam Budh Nagar (UP). "We got inputs that some members of the Bhura gang were planning to murder a famous businessman of south Delhi. For this, the gang was paid by the businessman's rival group. We learned that the said members would go to Defence Colony in an Accent Viva car and would pass through Bishma Pitahma Marg around 4 pm. We laid a trap and arrested the duo," revealed Dhaliwal, adding that the Bhura gang comprised local criminals of western UP who have good information about monetary transactions of the local business houses and other traders. The gang was also involved in the infamous daylight robbery wherein Rs 5 lakh were snatched from some employees of BIG Cinemas at Ansal Mall in Noida. They requested him to buy the phone as they needed cash. When he told them that he did not need the phone, one of them pulled out a country-made pistol and asked him to give his mobile phone to him. They also took away his gold chain, gold ring and purse, said H. N. Singh, superintendent of police.